This article first appeared in The Edge Financial Daily, on April 10, 2019. KUALA LUMPUR: The new 6% tax set to be imposed from Jan 1, 2020 on foreign digital service providers will be borne by the consumers, according to tax experts. The digital service tax, they said, is a tax on consumers and not businesses, as it is looking to tax a particular service. The foreign providers will bill their clients the tax and pass the collection to the government, in the same way local businesses collect the service tax from customers on behalf of the government, they said. Tax expert Senthuran Elalingam said, as an illustration, he currently subscribed to iflix, Astro, Spotify and Netflix. “Each provider charges me a monthly subscription. The first two are local companies, which are registered for service tax — charging me 6% service tax on each bill. “The last two are foreign companies, which are not required to register for service tax. However, starting Jan 1, 2020, Netflix and Spotify would need to register for digital services tax and bill me 6% service tax,” he told The Edge Financial Daily. “Hence, this puts them in the same position as local companies,” said Senthuran, who is Asia Pacific Financial Services Indirect Tax Leader at Deloitte Malaysia. The Dewan Rakyat passed the Service Tax (Amendment) 2019 Bill on Monday, paving the way for Putrajaya to impose the digital tax. Senthuran said to work out whether a foreign service provider is required to register for digital tax, the firm will need to look at the total annual fees received from Malaysian subscribers. If the amount exceeds RM500,000, then they are required to charge the tax on their customers, he said. “To determine the number of Malaysian customers in their database, the businesses will need to look if their customers registered or paid for their service with a Malaysian address, Malaysian telephone number, Malaysian Internet Protocol address or Malaysian bank credit or debit card,” he added. Another expert, S M Thanneermalai, said the government may face a challenge in imposing the digital tax on foreign companies. “The challenge will be to get the foreign provider to register for the tax. It is not going to be an easy task. Some may even refuse,” said the managing director of Thannees Tax Consulting Services. According to Thanneermalai, unless a way is found to force or incentivise the foreign providers to register, they would not heed the government’s call to do so. “Why would they want to do this voluntarily. I believe this might even deter some companies doing business in Malaysia,” he told The Edge Financial Daily. Sunway University Business School’s economics professor Dr Yeah Kim Leng said the imposition of the digital tax is essentially a broadening of the sales and service tax (SST) coverage. The government, he noted, is seeking to widen and diversify its revenue base following the replacement of the goods and services tax (GST) with SST. A tax rate of 6%, he said, can potentially yield about RM2.4 billion in digital tax revenue based on the Statistics Department’s survey on Malaysia’s e-commerce income in 2015. “It is difficult to estimate the actual size of the digital service but according to the department’s survey, the country’s e-commerce income was estimated at RM398 billion in 2015,” said Yeah. Vincent Loo Yeong Hong, an economist at RHB Research, said, however, that the digital tax revenue is not enough to plug the shortfall in government revenue for this year from scrapping the GST. 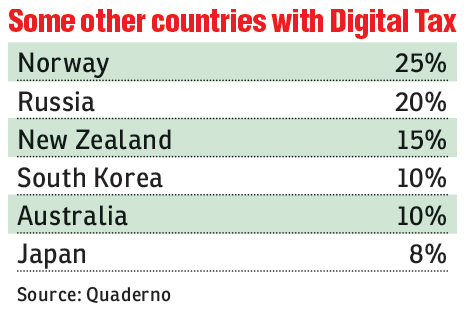 “There are only a handful of the foreign digital service providers that can be taxed,” he said, noting further that the 6% rate is low compared with the rate imposed by many other countries. Yeah, however, said the digital tax collection will grow bigger as the digital economy will continue growing. “Although the rough estimate of digital tax revenue is about a tenth of the foregone GST revenue, the government will be able to increase its revenue collection in tandem with the rising digital service growth trend,” Yeah noted. “If passed through by the service providers, end-consumers are expected to pay higher prices. The consolation for service providers and consumers is that they are helping to strengthen the government’s fiscal position as well as increase spending on development,” he added. Given the implementation of digital tax, the potential price hike for the services is expected. However, economists opined this is only a minimal impact for the consumers given the low tax rate compared with other countries who imposed the digital tax. “Not unlike the GST, end-consumers will be burdened with higher cost but at 6% [for the digital tax] it is one of the lowest rates in comparison with most countries,” Yeah said. Loo said the digital tax is “hardly a deal breaker” for consumers as most of the digital service subscribers are from the middle-income group and a price hike of 6% is still bearable. The digital service provider may also opt to absorb the increased cost, he added. AmInvestment Bank, in a report yesterday, said the digital tax may benefit media companies with television and over-the-top (OTT) segments such as Astro Malaysia Holdings Bhd, Media Prima Bhd and Star Media Bhd as competition from OTT players such as Netflix has pressured subscription revenue and average revenue per user. However, it remains to be seen to what extent the tax will benefit local players as Malaysia’s 6% rate is lower compared with rates in countries such as New Zealand (15%), Russia (18%) and Norway (25%). “Furthermore, pricing alone might not deter customers from choosing preferred content provided by foreign OTT players,” it added.